MADD London is focused on bringing the message to the local community in London and the surrounding area in Ontario, Canada. MADD London was formed in 1996 and continues to be an active part of our community as we work towards eradicating impaired driving. Our local initiatives are an integral part of MADD Canada’s mission. Our volunteers continually step up and work to educate the public and also support local victims/survivors. Trained Victim Service Volunteers (VSV) are available for victims/survivors for anything from emotional support to court accompaniment. Both of MADD London’s VSVs are victims/survivors themselves and as such have firsthand knowledge of what victims/survivors go through as they move through the process. Our volunteers go out into the community and attend health fairs, classroom presentations, and school assemblies educating Londoners on the dangers and consequences of impaired driving. We support National programs locally such as the School Assembly Program and Project Red Ribbon. We also host an annual 5K walk/run to help us raise funds to remain active in our community. We just are busy planning for our 12th year of our local Strides for Change Walk; last year we raised over $25,000. It is worth noting that every dollar raised in London remains in London to fund our local programs. We are currently working on a roadside signage project which will see MADD Campaign 911 signs at the various entrances to the city. These highly visible 4 x 8 signs are yet another visible reminder of sober driving. Moving forward MADD London is committed to spreading our message in London and the surrounding area. 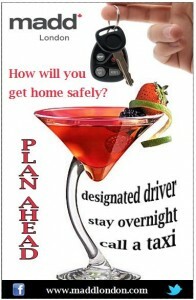 We have to stop impaired driving and we’ll do so one volunteer at a time. Do you need a victim speaker? Are you a student doing a project? Do you need someone to come speak to your group about the dangers of impaired driving? We have several excellent videos and visual aids that can help our knowledgeable volunteers show your people the effects of impairment. We can also offer handouts for presentations. Invite MADD London to your event.